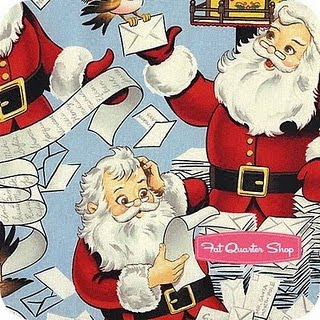 FatQuarter Shop is having this little "Letter to Santa" giveaway. 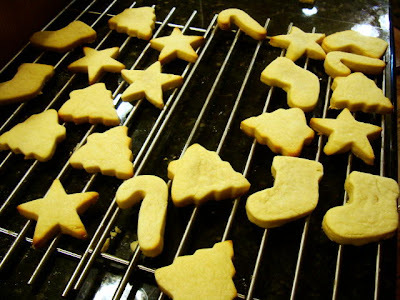 I missed the deadline but it has been really fun to read the letters to "Santa" on blogs and see what bloggy girls want. Dear Santa: First off, I've been good this year. Mostly. I won't take up your busy schedule considering it is just a few days from Christmas so I'll get right to the point. 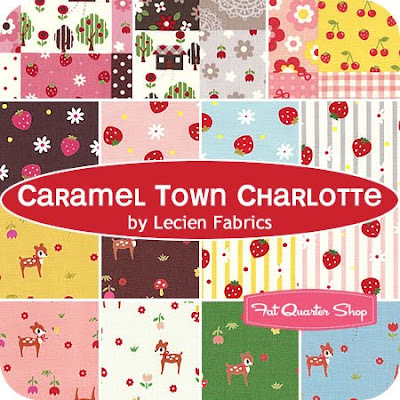 I really would like this Caramel Town Fabric bundle. I know I already have lots of fabric but please Santa. I Love This! The colors and patterns are so darling. Second on my wish list is the Old New 30's Collection above. Isn't it beautiful Santa? It looks like it was designed especially for me. I'll make sure to leave you some Oreos on Christmas Eve. And I promise to be good in 2010 and finish all my UFOs that I've gotten stacked up. And I promise to use these fabrics and not let them sit on my shelf. They are much to pretty for that. I got the idea from Jacquie to put the grommets in my hot pads. I love how the big silver grommet looks in the corner. Mr. Hive helped me with the grommets. I used left over blocks from past quilt projects and just bordered the ufo blocks into a size for suitable for a hot pad. I used the insulated batting and machine quilted them as quickly and easily as possible. I hand stitched the binding on a few of the hot pads but soon realized that I had to step up the process. So I also pressed my binding around the edges really well and then machine stitched in the ditch to catch the back of the binding. 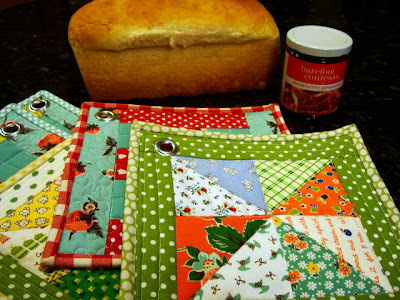 It worked out ok.
My neighbor gifts this year were bread, jam and a hot pad. It works. 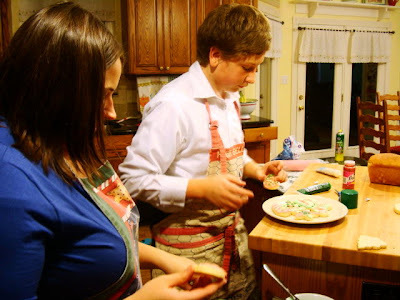 Mean while Mason and Shelbie made sugar cookies. 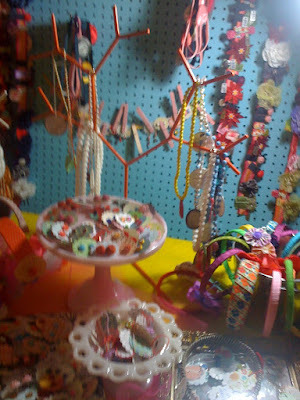 A few weeks ago Whitney, Shelbie, Allison and I went to the Beehive Bazaar in Provo. We got a card in the mail and looked at the website and decided it looked interesting. There is a bio on all the contributing artists and crafters on the website. Many of them have etsy stores. 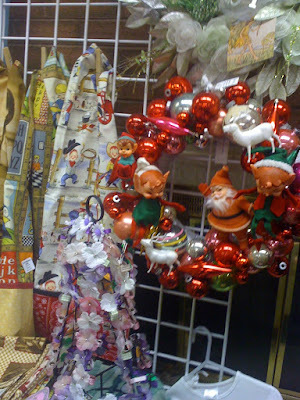 So even though the bazaar is only seasonal, in many cases their crafts are available all year round. I forgot my camera. Sheesh. But I did have my iphone so I snapped a few and these are the only pics that turned out. This paper mache reindeer really caught my eye. It was really a work of art. I wanted this wreath made with vintage balls, elves and deer. It's so kitschy. But it was just too pricey. It totally speaks to me but I left it behind. Sigh. Those elves kill me. 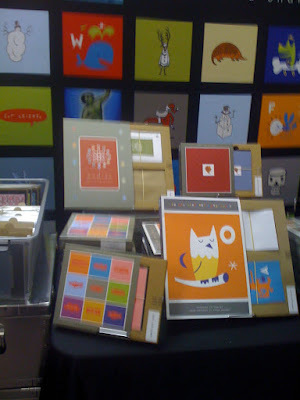 This artist makes cards and things. There were paintings and pictures all over that we liked. Of course I loved this owl. 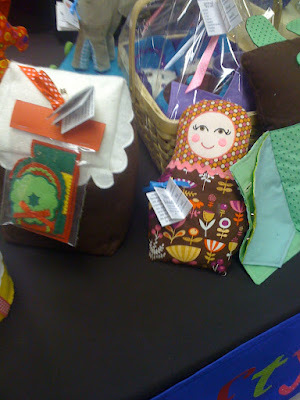 This darling matryoshka was on a table with some really good things. There was so much to look at and admire. There was quite a bit of jewelry. I did get a couple things for Christmas gifts. I just can't believe how talented people are. 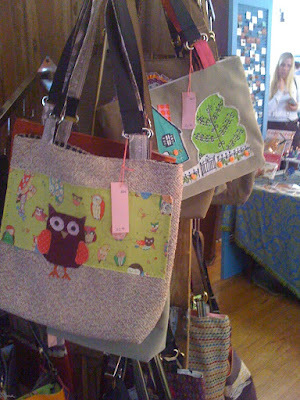 This crafter had the best bags. 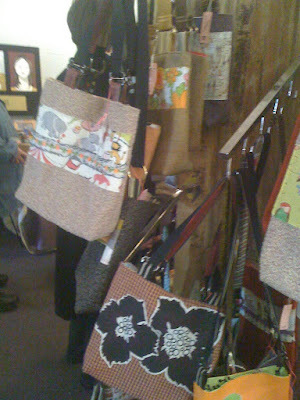 They are kind of hip and vintage creations with new and vintage fabric and textures. She rough edges fussy cut applique on the front of each bag. There were so many bags I loved. And they were very reasonably priced. I liked how she used trim and rings for the straps, too. See that house and tree bag in the back? A bag very similar to that came home with me. You might take a look at the artists/contributors at the bazaar website if you still need a gift or two. I like to support local moms working from home. 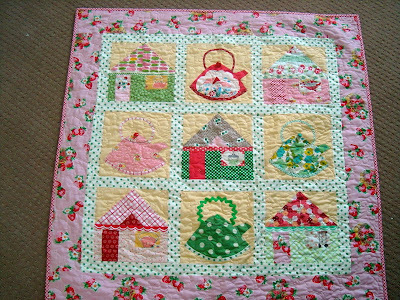 In the middle of the Christmas sewing crunch I squeezed in some time to make another sample quilt for my Kettles in the Kitchen pattern. I'm not quite sure how I did it but it was fun. I haven't gotten tired of making this quilt. 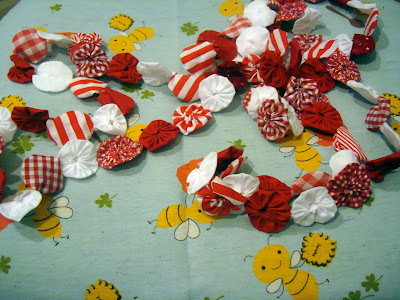 As per my usual I used mainly vintage and Lecien fabrics to make the samples. Above this teakettle is made with a small chunk of a vintage feed sack. Speaking of Lecien, American Quilting just got in a HUGE box full of beautiful Lecien goodies. If you live locally you have to go to the store to check it out (tell them I sent you ;-)). I've want to go back this week and check it out since it was still packaged when I was there last week. 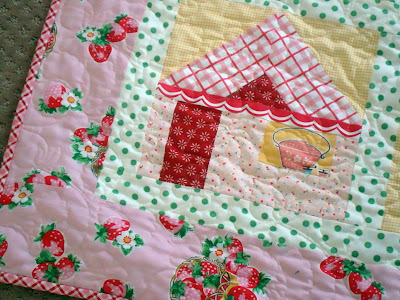 I used some of Lori's vintage fabric for the roof in the lower right hand of the photo. Lori was nice enough to share . Thanks Lori! 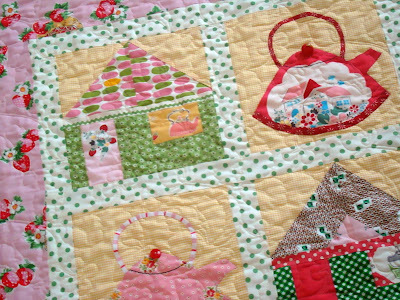 It works perfectly in this quilt. 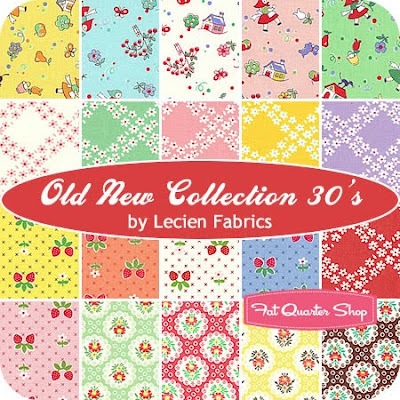 I really LOVE this Lecien strawberry print from the 30's line of fabric. 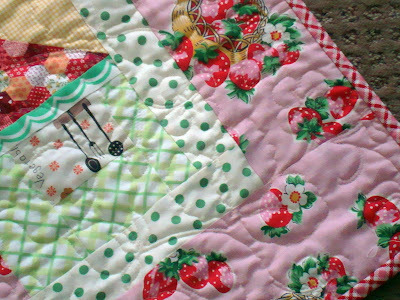 And I had the quilt machine quilted with strawberries from Eagle Mountain Quilting. I was so happy with how it all came together. It may just might be my favorite sample quilt yet. I was so incredibly lucky to get this strawberry basket print for the border. It's like a memory of summer strawberries. This latest sample quilt was taken to American Quilting in Orem Utah as a sample for a class I'll be teaching at American Quilting's retreat in Feb. 2010. The retreat will be held at a hotel in Provo, Utah. For details on how to attend contact Amy at American Quilting. 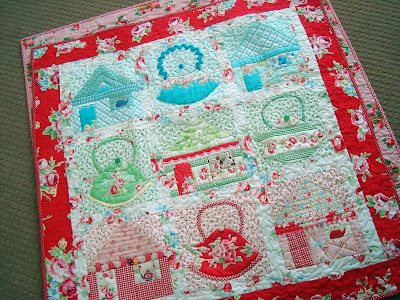 I took this sample to The Quilting Cottage in American Fork, Utah. I love the pink, red and turquoise. Another Lecien creation. And this sample was taken to Material Girls in South Jordan, Utah. More strawberry and Lecien loveliness. 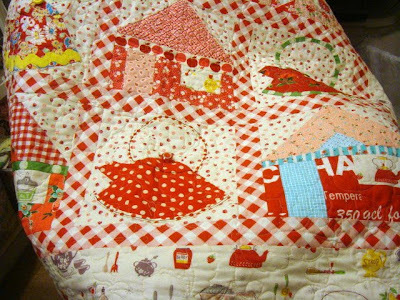 Eagle Mountain Quilting stitched strawberries into this quilt, too. 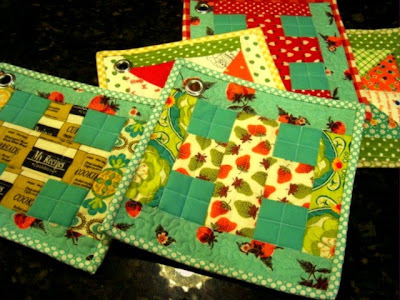 I love all 3 quilts. It is really hard to pick a favorite. 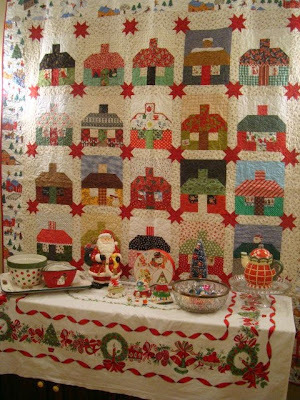 I'll also be teaching this same quilt along with my Mixed Bag to Quilt pattern in June, 2010 at the Panguitch, Utah Quiltwalk. I'm sure both retreats have spots open and both of the retreats will be fabulous fun. I hope to see some of you there. I have been pretty busy this weekend. Shopping, errands, tree, sewing, wrapping, cooking, baby fun added with lots of new snow. 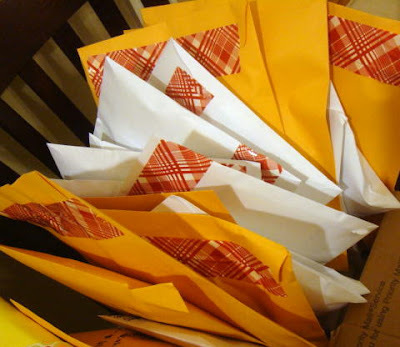 I have all my packages to be mailed ready to go. You have no idea how good that feels. I'm starting to feel like Christmas really is coming and I might be ready, somewhat for it! 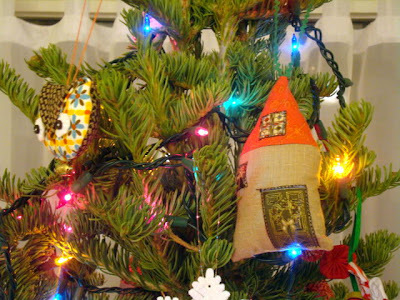 I finished my ornaments and decorating projects. 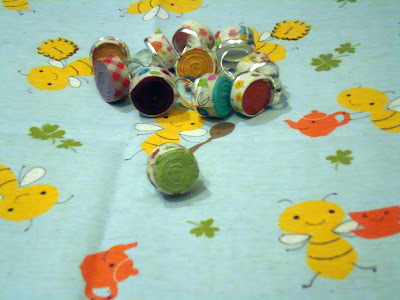 Mr. Hive helped me put the grommets in the vintage table cloth stars. I'm really happy with how they turned out. 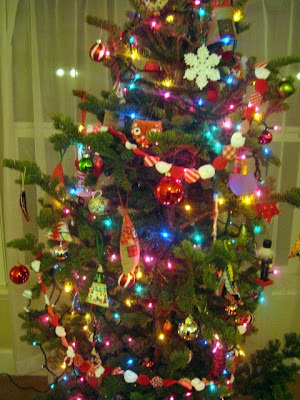 The kids helped decorate the tree. It was fun even though the youngest of the kids are all teenagers now and that innocent wanderlust of Christmas is faded. 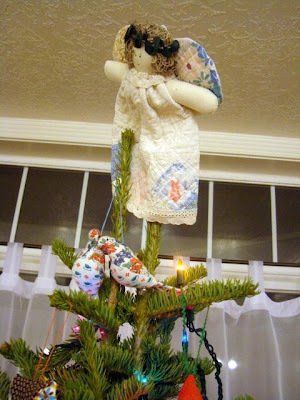 I used my sweet angel given to me by Terri last year for the top and the ornaments made by Eileen. It makes me smile to see them on my tree. 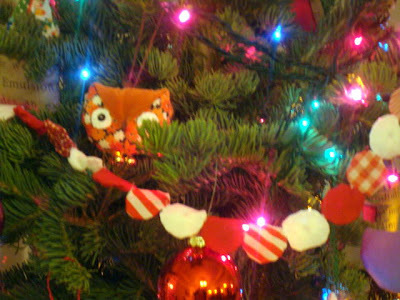 Of course I have my ornaments I made from last year sitting front and center on the tree as well. 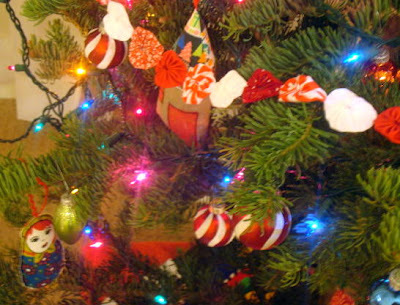 And my new yo yo garland drapes across the tree. It isn't a huge tree but the price was kind of big for a fresh tree. At least I thought so. 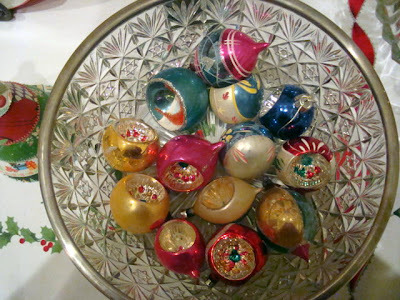 My daughter Jamie says there are too many ornaments. I don't think so. Can there ever be too many ornaments? I don't have tons of decorations around the house. Too much seasonal stuff makes me uncomfortable. But a touch is nice. I have the little trees I made from last year on the entry sideboard. 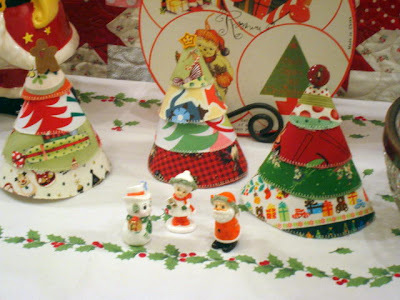 I added 3 tiny figurines after seeing Belinda's little arrangement of trees on her blog. Love it. Of course my quilt is front and center in my entryway above the sideboard. I love this tree. So many good memories. 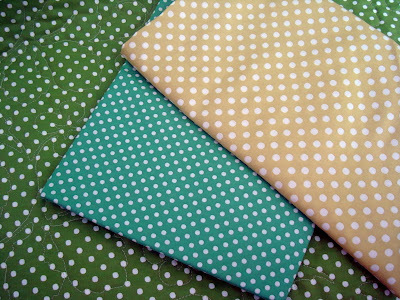 Fabric Friday today goes back to basics in fabric. 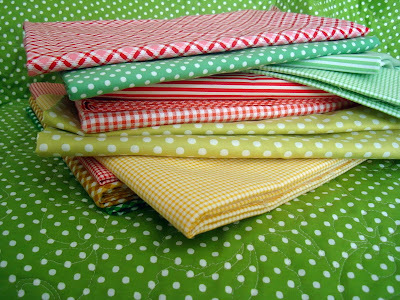 I have a stash of basic fabrics that I use all the time in most of my projects. I've thrown a few basics together to show you. I'm sure you have these in your stash too. I love stripes of all sizes, wide, medium and large. 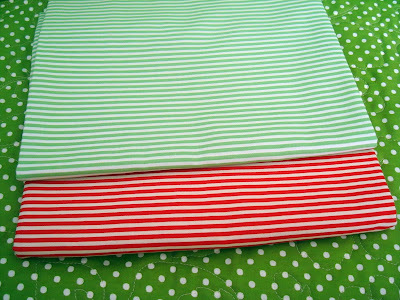 These mini stripes are perfect for binding and accents in my quilts. 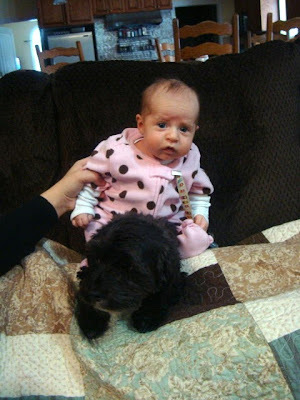 Baby gingham - love it. 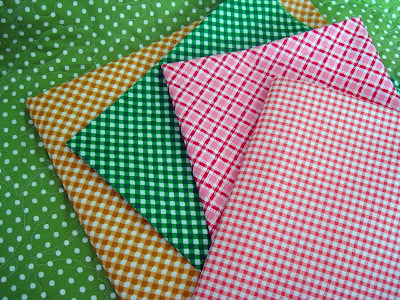 This is not your grandmother's gingham. You can see these 3 are from Lecien. 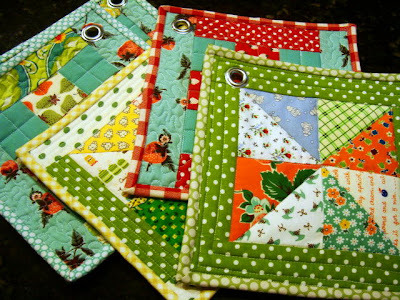 They have a great feel to them and are a great quilt weight. I wish I had them in more colors. 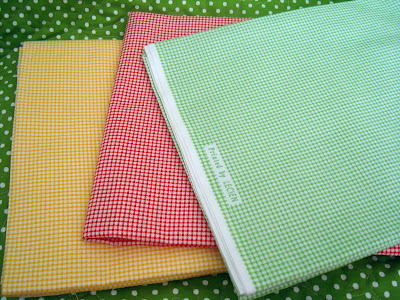 More gingham but bigger. I love the rich gold color and the bias set of the green and gold. The pale orange and pink are really great for bindings too. Finally dots. I have dots of all sizes and colors in my stash and I love them. Dots are my favorite. I probably have them in every quilt. 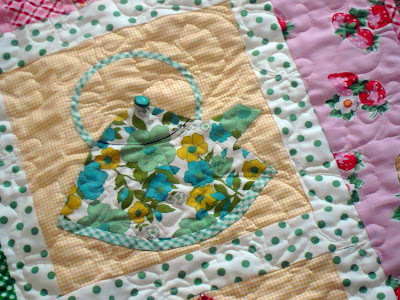 I put together a new sample quilt of my Kettles in the Kitchen for a quilt shop. 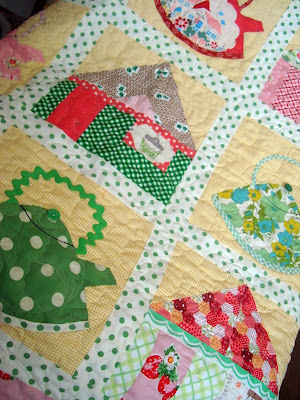 I used my basics in this quilt to rest the eye and accent the bolder prints and novelty fabrics. 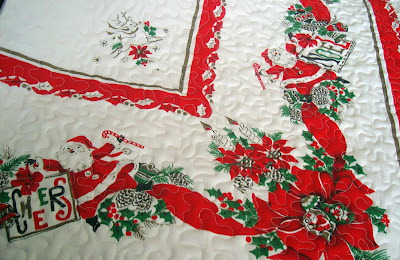 More pics from this quilt next week. I'm off to Christmas shop. Have a nice weekend. 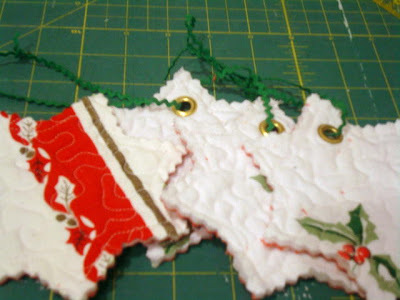 I hope it isn't too late to be working on Christmas ornaments, decorations and gifts. Are you all ready for Christmas? Because I am not! Yet again I scramble. 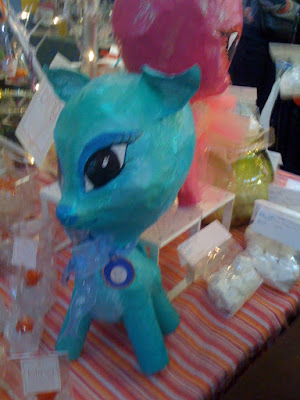 Some of my projects are my idea and some are things I've seen around blogs and etsy. Vintage linen that has stains or holes is called "cutters". 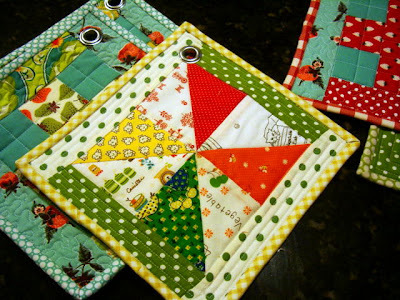 I have a few Christmas linens that I've been wanting to make into decorations. I washed a piece of this cutter tablecloth above. Then I stippled it (like it was a small quilt) with close curves and a red dot back. I washed it and dryed it again after it was quilted so it would crinkle up. Then I used this template to trace stars all over the quilted table cloth. 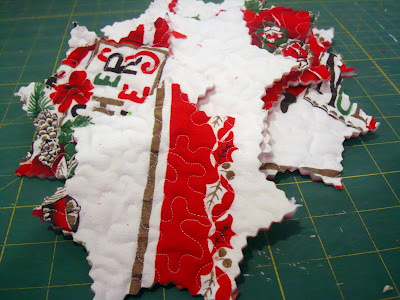 I cut them out with scissors and then I used my rippled edged rotary cutter blade to wave the edge of the star. 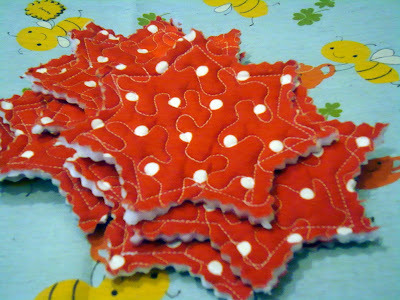 I cut the stars out fitting as many as I could from the quilted fabric without fussy cutting them. I want a more random look. Then I stitched 1/4" from the edge of the stars. Now I still need to put a grommet in one of the points and string mini green rick rack so I can hang them. 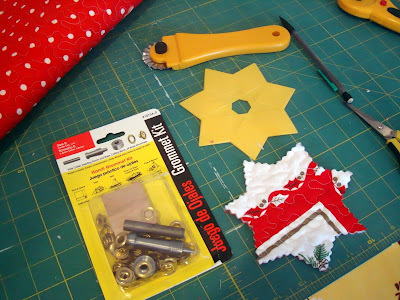 I have lots more to make so I'm waiting until I am done to put the grommet/holes in the star. I'll let you know how that works out. I purchased this banner on Etsy from VintageHome. She has darling home decorations. 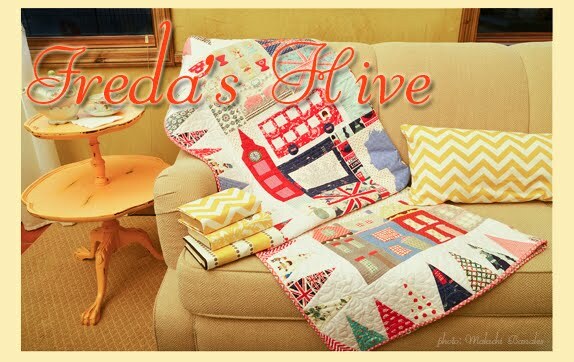 I loved how she used cutter tablecloth fabric to make the banner. 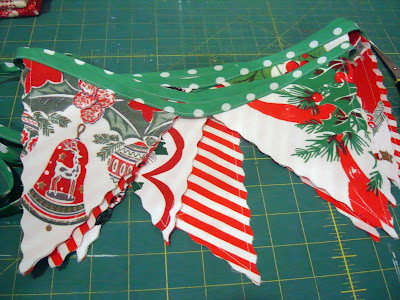 And after making Allison's banner I had an idea for making a Christmas banner using tablecloth fabric . 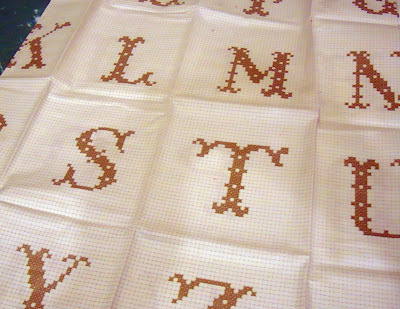 . . and this gold cross stitch letter fabric from Holly Holderman of Lakehouse Fabric. 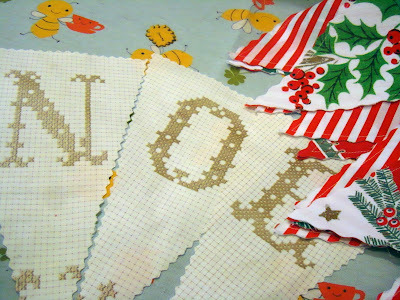 I started cutting out letters to spell NOEL and I thought I would center the letters in the middle of the banner with Christmas fabric/Christmas table cloth fabric flags on either side of the letters. I'm working on all that still. So I'll keep you posted. I saw these pin cushion rings on a few blogs and fell in love with them. Etsy seller artnetshop makes them and sells them and I think she does a fabulous job. I purchased a few from her for gifts but really wanted to make some for myself. And so I did. The first couple didn't turn out so great but I kept at it and with the help of Shelbie and Mr. Hive I am really happy with the results. I think they are cute and very practical. I used wool and printed linen. They were fun to make. Of course I wouldn't sell any of these items or compete with those etsy sellers. These things are for me or for gifts. Who has time to post?